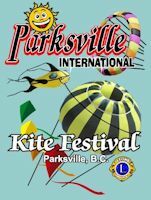 Annual International Kite Festival - sponsored by the Parksville Lions Club and the British Columbia Kitefliers Assocation. It is held in the Parksville Community Beach Park during July each year. During the festival there will be food concessions in the park, various vendors, bathroom facilities, kite building tent for beginners, kite demonstrations, banner displays, Popular Teddy Bear Drop. Parksville, B.C. – James Lunney, Member of Parliament for Nanaimo-Alberni, on behalf of the Honourable Lynne Yelich, Minister of State for Western Economic Diversification, announced support for upgrades to the Parksville Community Park under the federal government’s Community Infrastructure Improvement Fund (CIIF). The investment of $65,597 will be used to install an outdoor fitness centre at Parksville Community Park. 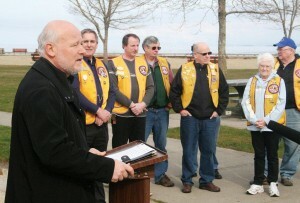 The Parksville Lions Club, which initiated the project, has designed the centre with rubber surfaced sidewalks to make the facility fully accessible. In Economic Action Plan 2012, the federal government announced further support to help communities across the country modernize their infrastructure. Our government committed $150 million over two years for the Fund. The Fund supports projects that look to improve existing community infrastructure accessible for use by the public, such as community centres, recreational buildings, local arenas, cultural and other community facilities. Since 2006, the government through WD has invested in job-creating small- and medium-sized businesses, aerospace, marine and defence industries, and supported innovative entrepreneurs in pursuing emerging markets. By continuing to promote new economic opportunities, WD is helping to create jobs, economic growth, and long-term prosperity.